In enormous and populous India, anonymity does not exist. And social or group orientation counts – in a big way. Ironically, this is apparent in laidback Kerala, a lush coastal farming state in the southwest of the country. In Kerala, Jews, Christians, Muslims and Hindus basically lived in harmony for years. Yet, within the region’s small Jewish community – often referred to as Cochin Jews, since almost all the Kerala synagogues were built in the kingdom of Cochin – differences have existed between the apparently ancient Malabar Jews, the Meshuhurarum, whose ancestors were reportedly freed slaves, and the Paradesi Jews, who arrived hundreds of years later. Frequently, the groups referred to each other, sometimes derogatorily, as Black Jews, Brown Jews or White Jews. Even today, when one talks with those involved in these communities, issues related to paternalism, land rights and misappropriation of property enter into the conversation. How have these divisions expressed themselves? A sense of imbalance sneaks in when learning about the famous Tamil script copper plates. The area’s ruler, Bhaskara Ravi Varman, presented these special plates upon the Malabar Jews’ arrival in 1069 CE, although the Malabar Jews often claim they arrived in southern India with King Solomon’s merchants. The plates provide a detailed list of the elevated rights and privileges the sovereign bestowed upon his new residents. Somehow or other, these important proofs of status are no longer in the possession of the Malabar Jews. Rather, they are reportedly held by the Paradesi Jews who arrived in the 16th century from Spanish, Portuguese, Iraqi, Yemenite and European lands. Just how the Paradesi came to control them is not spelled out in historical accounts of these communities. It is simply presented as fact. Still, the Malabar Jews managed to live a peaceful existence, working largely as shop owners. Over time, they spread out to five different Kerala towns and villages: Cochin, Ernakulam, Parur (also written Paravur), Chendamangalam and Mala. For Zionist rather than antisemitic reasons, the Jewish population, especially the Malabar Jewish community, resettled in Israel in the 1950s. The cemeteries and the eight or nine synagogues they built in the 1500s through the 1600s were left behind. Today, the Malabar Jewish community’s presence in southern India is still felt, albeit not strongly. The Kerala governing body took upon itself to restore the community’s Chendamangalam Synagogue and Parur Synagogue. These centres of former Jewish life are now museums. However, some empty Jewish institutions are now being used for other purposes, such as offices, storerooms, handicraft and antique shops. 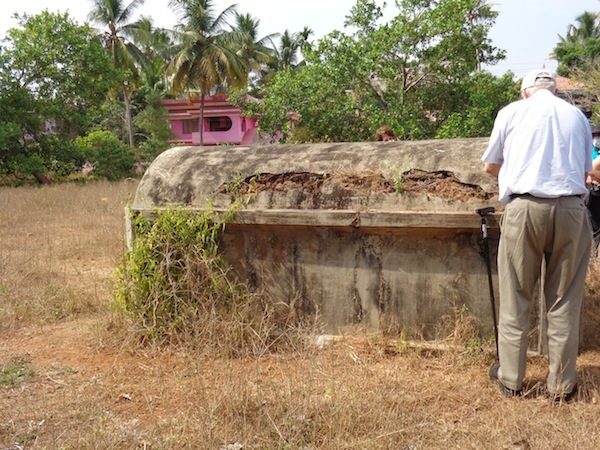 While five aging Paradesi members (and outside sponsors) maintain their synagogue and cemetery, this is definitely not the case in the Malabar Jewish cemetery in Mala. A sizable portion of it has been parceled off to build a stadium, which, in turn, might be converted into the K. Karunakaran Sports Academy, and graves have been desecrated. Significantly, this land grab violates the cemetery and synagogue preservation agreement the Malabar Jews signed with the Mala panchayat (the elective village council in India) before making aliyah in 1955. Villas now stand on the northern edge of the cemetery, but these were built on land the Malabar Jews sold to locals, so that they would have enough money for the move to Israel. Importantly, Karmachandran and other Kerala Christians, Muslims and Hindus have mobilized themselves to form the Heritage Protection Society, Mala. The group’s goal is to save what they consider not just their former neighbors’ Jewish heritage, but what they maintain is their common Indian heritage. To assist in the preservation project, contact Karmachandran at [email protected]. Oh, Lovely Parrot is a composite of musical pieces sung in the Malayalam language by Kerala Jewish women. As part of its digitized Jewish music conservation project, the Israel National Library (in collaboration with Hebrew University) offers free listening from its website. The online Jewish art collection of the library also has about 200 of Zev Radovan’s 1995 black-and-white photos of religious objects from the Malabar Jewish community. A few years ago, Essie Sassoon, Bala Menon and Kenny Salem published Spice & Kosher: Exotic Cuisine of the Cochin Jews. Also, in Claudia Roden’s The Book of Jewish Food: An Odyssey from Samarkand to New York, there is a section devoted to “The Three Jewish Communities of India.” Finally, in his book Olive Trees and Honey: A Treasury of Vegetarian Recipes from Jewish Communities Around the World, Rabbi Gil Marks (z”l) devoted space to presenting a number of curried vegetarian Indian dishes. Reconstructed Malabar synagogues are on view in different locations around Israel. Over a period of several years, Jerusalem’s Israel Museum restored the interior of Cochin’s Kadavumbagam Synagogue. It was opened to the public in 1996. The heichal (ark) and tebah (podium) originally came from the Parur Synagogue. Oddly enough, since the 1950s, the synagogue’s original heichal has been in use at Nehalim, an Israeli moshav composed of Orthodox German Jews. Moshav Netivim has an active synagogue and the Cochin Jewish Heritage Centre with artifacts of the Malabar Jewish community. Previous Previous post: Was the Last Supper a seder?